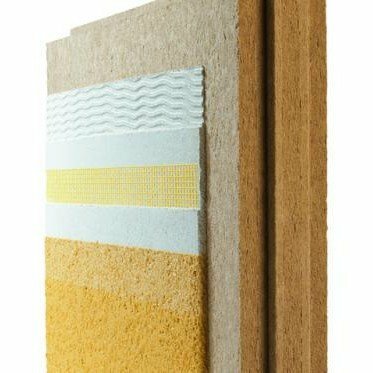 Diffutherm external wood fibre insulation board is a sustainable EWI (External Wall Insulation). Diffutherm is a tried and tested system in the UK that has good thermal performance and excellent decrement of solar gain. Therefore buildings insulated with Diffuthem are much less prone to overheating during periods of sustained hot weather. Use against a solid background, or over studs and joists when protected with a lime render. This system has both BBA and LABC approval. 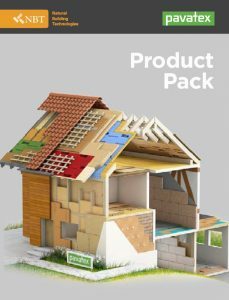 Suitable for use with Passive House and Code 6 new buildings. Wall: Fit directly on to studs or existing masonry. Rendered with an appropriate render system. If the Diffutherm is being installed in exposed locations such as rainfall zones 3 and 4, the SilikonTop render is the preferred render finish as it offers greater protection. Available in a range of thicknesses from 60 mm up to 120 mm. The boards are tongue and groove and measure 1430 mm x 560 mm (excluding T&G) giving a coverage of 0.80 m² per board. Diffutherm has a Thermal Conductivity value of 0.043 [W/(mK)]. Diffutherm forms part of the NBT EWI rendered systems used for both New Build and Retrofit developments.